Years ago I read an article that caused me to wonder if I too was a human “doing”, rather than a human “being”. Like those described by the writer whose name I can no longer recall, I rarely just be. Mostly, I do. In early September, I shared an experience with my colleagues on the Louis Riel School Division Literacy Team in Winnipeg that reminded me of the value in taking the time to think deeply and collaboratively about things you’ve already done – before you DO something else. In May of the last two years, this team asked schools in their writing project to do a school-wide write on various grade level specific topics, something many of you also do. 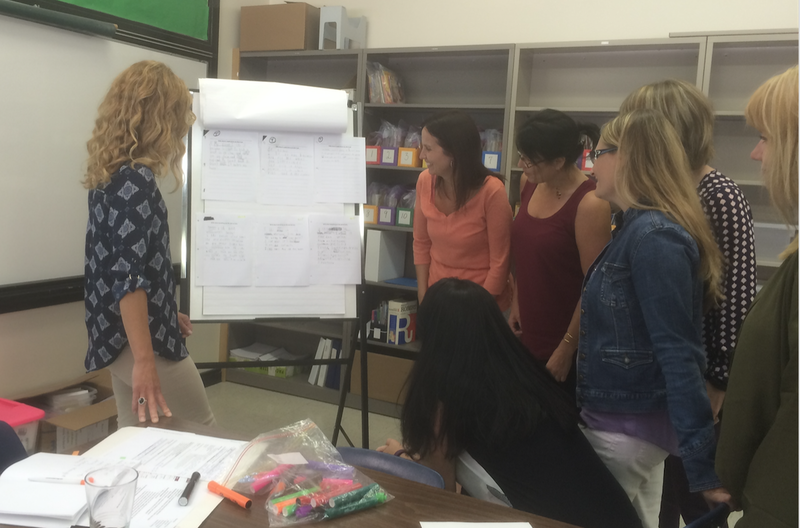 Grade level teachers identified typical samples that were then deconstructed by teachers working in vertical teams. Charts were created that listed what was present in the work, and what the writer was able to do. In preparation for the session last May we discussed the purpose of the sample collection at the system level – our purpose as the team guiding the project divisionally. Before jumping into the work of this year, we paused to review our assessment data and to consider what it might be telling us. As you can see from the slide above, we collected evidence of both student and teacher learning. As befits a team whose role is support and not evaluation, we analyzed the samples from an assessment for learning stance. What do you notice when comparing the 3 typical grade level samples from Year 1 to Year 2? What might this mean for instruction? What do you notice as you consider the typical samples across grade levels? What evidence do we have of a year's growth between each grade? How might this inform our classroom demonstration lessons this year? How might this inform professional learning for the teachers this year? What patterns and trends do you see in what teachers are noticing in the writing? What might this tell us about next steps for teachers? We began with student learning and compared the three typical samples from a grade level after Year 1 of the writing project to those after Year 2. After reviewing two grade levels we saw the value in the comparison and made a plan to dedicate more time to it. We recognized the power of the activity and decided to model it in an upcoming session for teachers. We noticed that our evidence consisted only of products. Knowing the value of evidence from conversations and observations, we made a note to discuss and plan for a way to broaden our divisional evidence. The vertical teams reviewing Kindergarten and Grade 1 samples noticed many characteristics that they categorized as conventions. Is this evidence that it is difficult to see beyond conventions when looking at beginning writing? Is this evidence of our instructions for the task? Is this evidence that teachers need more "big picture" conversations? Further discussion revealed that team members recalled the conversations connected to these particular lists of strengths and heard the vertical team talk about message, thinking about the reader, and revising to improve writing. We made a plan to more formally triangulate the evidence of our learners - the teachers. We noted that when we come together to do this again in May we would revisit criteria we co-constructed earlier about what writers do. We will use these criteria to really understand or change the categories we have been using to code the strengths we see in the writing. · Just as classroom teachers around the country are gathering and reviewing assessment data from the end of last school year and the start of this one, we facilitators of professional learning and designers of district-wide projects apply the same principles to our own work. In this way, we all achieve the same end – baseline data that allows us to create learning destinations that meet the needs of our specific learners and to make changes in our own teaching. I understand from the thirty thousand foot view, but how do I start? Fourteen years ago, when I stepped out of my classroom and into the world of instructional support and professional learning, I asked myself the same question. The twinge of anxiety behind the question was fuelled in part by those around me who said, “It must be really different (and therefore terrifying) to work with adult learners.” The implication being that this new job had nothing at all to do with what I had done as a classroom teacher. I am forever grateful that it did not take me all fourteen years to figure out that this is simply not true. While I no longer have a classroom and students in the traditional sense, and there are definite differences in supporting adult learners, I start with each new teacher or team of teachers in ways that are very reminiscent of the tenets that guided me as a classroom teacher. This quote from Margaret Wheatley (2002, p.19), all five words of it, describes to what I attribute any success I have ever had as a teacher or consultant. Just as it was in my classroom each new school year, building relationships with the educators I work alongside is my first priority. If we are to do real work together, teachers and school leaders need to know they can trust me. They need to know that I honour their practice and believe in their ability and willingness to do all they can in service of their students. They need to know that it is safe to try new things and take risks in my presence. I didn’t know what to expect the first time I taught a lesson in a classroom that was not my own, with the classroom teacher and other team members observing. It was not something I had ever experienced during my years as a classroom teacher. But from the moment teachers began to share their observations, I knew the gradual release of responsibility that had been a cornerstone of my teaching was equally essential in my role as instructional support. Modelling, shared practice, and independent practice are not artificial constructs that exist only in “school” learning. It’s how most of us learned to drive, what apprenticeships are based on, and how I think about professional learning. Seeing is more than believing, it is understanding. When we take professional learning into the classroom and do a demonstration lesson for others to observe and then debrief together, talk honestly about what worked, why it worked, what we might do differently next time, we are modelling. We engage in shared practice when we co-plan, co-teach, and look at student samples together. And, just as it does with students in our classrooms, this gradual release leads to more reflective independent practice. A clear learning destination – where are we going? Descriptions of quality and proficiency – what can success look like? Triangulated evidence that we are making a difference with the changes we are implementing. This is how I start – with the same good teaching practices that helped those who hired me believe that I could be of service to my colleagues. Wheatley, M. (2002). Turning to One Another: Simple Conversations to Restore Hope to the Future. San Francisco,CA: Berrett-Koehler Publishers, Inc.